PLANNING AIM: To determine the concentration of a limewater solution. You have been provided with 250cm3 of limewater, which contains approximately 1g dm-3 of calcium hydroxide. Hydrochloric acid is also available, which has a concentration of exactly 2.00 mol dm-3. 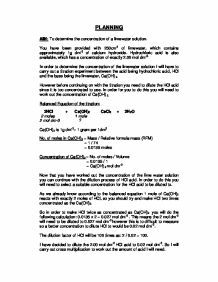 In order to determine the concentration of the limewater solution I will have to carry out a titration experiment between the acid being hydrochloric acid, HCl and the base being the limewater, Ca(OH) 2. However before continuing on with the titration you need to dilute the HCl acid since it is too concentrated to use. In order for you to do this you will need to work out the concentration of Ca(OH) 2. Balanced Equation of the titration: 2HCl + Ca(OH)2 --> CaCl2 + 2H2O 2 moles 1 mole 2 mol dm-3 ? Ca(OH)2 is 1g dm-3= 1 gram per 1dm3 No. of moles in Ca(OH)2 = Mass / Relative formula mass (RFM) = 1 / 74 = 0.0135 moles Concentration of Ca(OH)2 = No. of moles / Volume = 0.0135 / 1 = Ca(OH) 2 mol dm-3 Now that you have worked out the concentration of the lime water solution you can continue with the dilution process of HCl acid. ...read more. * 250cm3 of HCl, 2.00 mol dm-3. * Distilled water. * 250cm3 volumetric flask and stopper. * Funnel. * Eye protection. METHOD: 1. Set up the burette stand and place the burette inside it. 2. Fill the burette with HCl acid, 2.00 mol dm-3 using a funnel to avoid spillage making sure the bottom of the meniscus touches the line. 3. Make sure the volumetric flask is clean and dry. 4. Place the volumetric flask underneath the tap of the burette. 5. Gently open the tap of the burette to allow the HCl acid to flow into the volumetric flask and close the tap when 2.5cm3 of HCl have been added. 6. Add distilled water to the volumetric flask containing the acid. *2 However you should not add water to HCl acid as the first drops of water will react completely, exothermically with the acid, boiling it and causing spillage. Nevertheless in this case you will add water but a little bit at a time and then put the stopper onto the volumetric flask and shake it to dilute the acid each time. ...read more. 11. The acid is then added to the Ca(OH)2 from the burette by opening the tap. A right handed person should use his left hand to open to open the burette tap and the right hand to hold the flask at the neck. 12. Release the solution of the HCl into the limewater solution slowly, observing the volumetric flask. When the solution changes from a light orange to a very light pink colour, this is an indication to stop and record the result. The white tile underneath the volumetric flask helps you with this because it gives you a better view of the colour change. 13. If the solution has turned pink then this is an indication that you have stepped over the end point and the titration is not valid. 14. Read off the side of the burette accurately how much volume is left and take this away from the initial volume to give you the volume of acid required to neutralise the base and record the titre. 15. Repeat the experiment 3 more times to give you more accurate results as anomalies do occur in this experiment. 16. 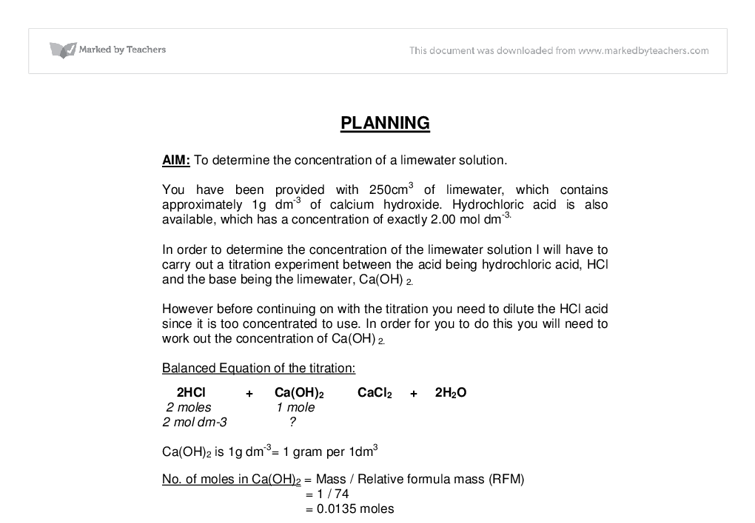 Note all readings and work out the average of the volumes and work out the concentration of the limewater solution using the formula: concentration = no of moles / volume. ...read more. Phenolphthalein indicator is an irritant and is thought to be mildly carcinogenic gloves should be used when handling. When using glassware caution should be used. On filling burettes/pipettes it is imperative that they be filled below eye level. Investigation Evaluation. Although some of the acute hazards and symptoms associated with the concentrations I am using will not be as severe as those shown below, the risks are still very serious. For this reason I will still take appropriate precautions and will handle each substance with care. First I will work out the number of moles of sodium carbonate in this solution: I can use this value for the number of moles to work out the mass of sodium carbonate required for this solution: Indicator Choice I need to decide which indicator will be most suitable to use in my investigation. measure & record the pH changes on addition of 0.1M NaOH (0 cm3 , 1 drop , 1.0 cm3 and 5.0 cm3) in Table 1. Rinse the electrode in distilled water & stand it in a flask of distilled water. Its structure is a covalent crystal lattice, consisting of infinite chains of phosphorus atoms; it has stronger intermolecular bonds, making is less reactive than white phosphorus. Unlike white phosphorus, it does not ignite at temperatures under 280�c and has a melting point of 590�c6, and so is safer to handle.